The campaign map is lettered and inscribed below: Plan du Camp de Prats del Rey 1711. followed by two columns of eleven illegible names, the left-hand lettered A-K, the right-hand 1-11; signed and dated, bottom right: T Bardwell pinxit 1740 (T and B in monogram). The map refers to Argyll’s actions in Spain when he took up a fortified position at Pratz del Rey, near Igualada, Barcelona, in September 1711; following a bombardment by the French, little action seems to have taken place. 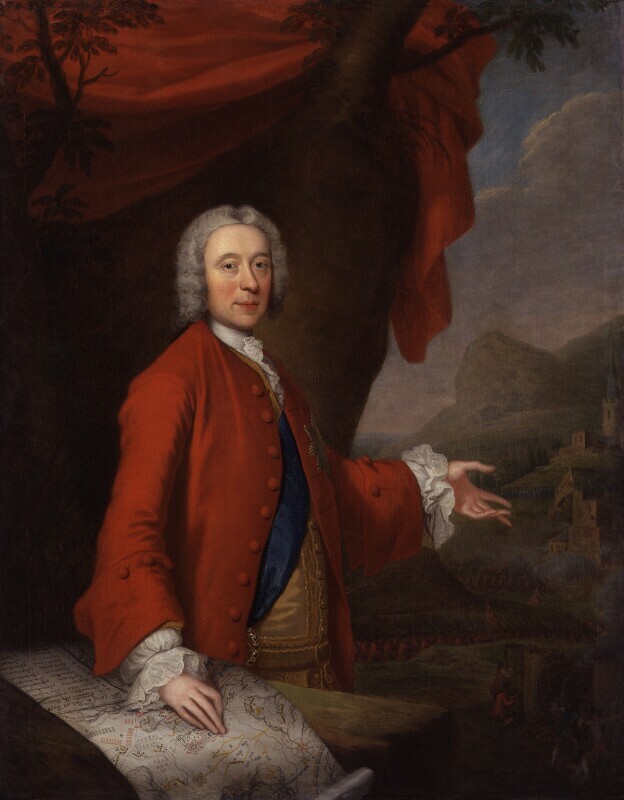 In 1740, the year NPG 3110 was painted, Argyll was dismissed from all his offices following his harsh but popular criticisms of the Walpole government. 1) As described by D. Piper, Catalogue of the Seventeenth Century Portraits in the National Portrait Gallery 1625-1714, 1963, citing A. Parnell, War of the Succession in Spain, 1888, p 301, and R. Campbell, Life … of John, Duke of Argyll, 1745, pp 69-70. 2) M. Kirby Talley, Wal. Soc., XLVI, 1978, pp 129-30, no.6. 3) Ibid., p.91 and nos 39, 42, 67, 92. M. Kirby Talley, Wal. Soc., XLVI, 1978, pp 91, 111, 129 no.5. [2nd Duke of Buckingham; Stowe sale, 21st day, 12 September 1848, lot 2, bought Morant for the Duke of Argyll, and said to have come to Stowe from Gosfield]1 The Dukes of Argyll; Rosneath Castle sale, 7-11 October 1940, lot 1296; Appleby’s, from whom purchased 1942. 1 MS note in NPG copy of the Stowe catalogue; Gosfield Hall also belonged to the Duke of Buckingham.